Spreading joy this Holiday season with a magical giveaway for Free Disney World or Disneyland Park Tickets! You know those days your heart aches as a parent? When your kids grow up right before your eyes? Christmas is a magical time of year, but as kids grow older they start to doubt the magic of the season. It’s tough when they start to doubt things. My friend Amy just had to explain to her little girl that her family still believes and no matter how old you get, or how you celebrate the holiday season, you can always count on magic being in the air! There is magic by coming together with friends and family, gift giving and doing good deeds for those in need. You can’t deny this is a special time of year. 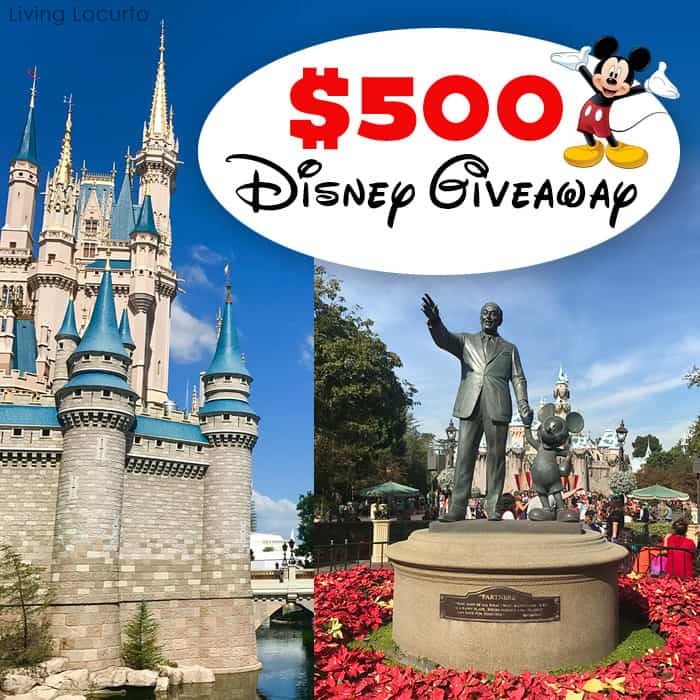 To help spread some cheer we’re joining her in giving away a $500 Disney Gift Card good for Free Disney Park Tickets to one lucky person! What better place to believe in magic than at the most magical place on earth? It would be so fun to do Disney. What a great giveaway. Good luck to everyone who enters. I grew up going there and some of best childhood memories are going there with my Grandparents. I have taken 3 of 4 of my kids there, but I haven’t been there in 23 years. My 12 year old has just now expressed interest in going there because none of his friends can believe he has never been there. This would certainly help with expenses!! Years ago my mother bought my husband, my children and myself tickets to Disneyland. My children were thrilled. We were so excited as we rode the boat over to the park. My daughter scans her card and it had been cancelled. My oldest girl had the same result. All of our tickets had been cancelled. My mother had cancelled the cards and spent the money touring around Florida. We were devasted. What was to have been a week in Fla and three days at Disney was now going to be one of the worst memories of my children lives. A few moments later an older woman saw the anger on my face and my children's tears and went to speak to my husband. He returned with 4 tickets into the park for that day. Now, we didn't get our 3 day park hopper's but my children did get to go to Disney thanks to a total stranger. Everytime we hear stories about Disney we smile just a little. My 5 year old granddaughter would love this! I would love fo go to Disney! I love your site. Have done many of the craft items you have posted. Also love the printables, use them all the time! Would love to send my Grandchildren to the Disney Park. I just submitted my entry. Our family is actually going to Orlando this Christmas for a family reunion but really tight on budget to even go to Disney World. It would be a dream come true for my 3 children! Thank you!